Harris Boats teamed up with Bart’s Water Sports this past summer to offer weekly pontoon-accessory prizes during the "Cruise into Summer" promotion. Now the results are in! In all, over $1,500 worth of gear was given away, from life vests and waterproof speakers to water skis and a WaterMat. Ron R. of La Valle, WI took home the WaterMat as grand prize, noting, “I am elated." But it was a smaller prize that may have turned a life around. Michelle B. of North Billerica, MA won a boating vest safety pack, and responded "No way! … I never win anything, thanks again." Congratulations to all the winners and thanks to Bart's Water Sports for partnering up for all the fun. 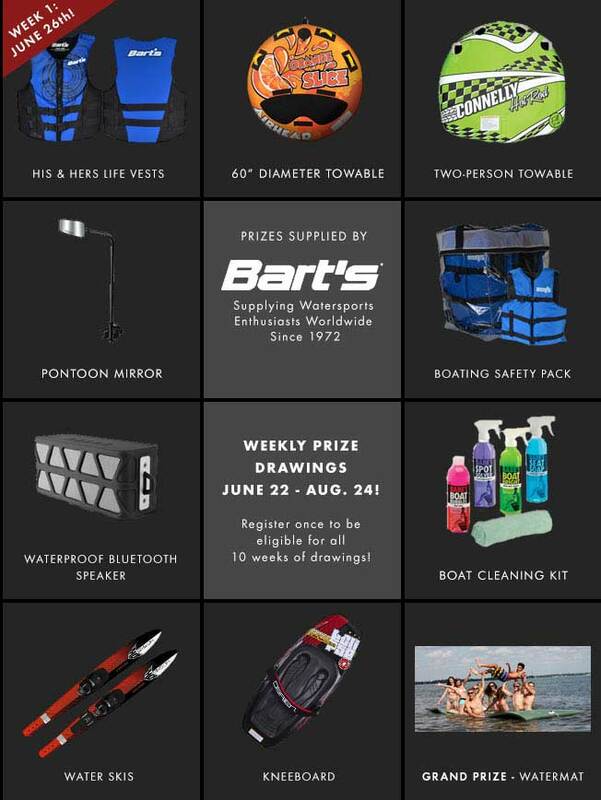 Be sure to keep reading harrisboats.com and following Harris Boats on Facebook for news about future giveaways. See a rundown of all of this summer’s winners below. Dennis F. of Green Bay, WI won a pair of Bart's Lithium Super Soft His & Her Life Jackets. Doug S. of Waterford, WI won a 60-inch Airhead Orange Slice Towable Tube. Erika A. of Poolesville, MD won a Connelly Hot Rod Towable Tube. Michelle and Jay B. of North Billerica, MA won a Bart’s Adult Boating Vest Four-pack. Brenda P. of Carp, ON won a Cipa Pontoon Mirror with Bracket. Eric T. of Woodward, OK won a NUU Splash Trail Waterproof Outdoor Bluetooth Speaker. Jeff B. of North Baldwyn, MS won a Babe’s Boat Care Cleaning Kit. Matt M. of Sale Creek, TN won a set of 67-inch HO Burner Combo Water Skis. Jennifer M. of Monroeville, OH won an O'Brien Eclipse Kneeboard. Ron R. of La Valle, WI won the grand prize of a Bart's Premium WaterMat. Harris is one of the foremost designers and manufacturers of custom pontoon boats and luxury pontoon boats.